My name is Joseph Edward Lawrence. I go by Joe Ed. I am from O’Donnel Heights. When I grew up, in my area everybody worked three places: Sparrows Point, Sparrows Point ship yard, or Fisher bodies Chevrolet plant. And I knew a lot of people who worked at Sparrows Point. My brother was a foreman down at Sparrows Point. So when I got out of the service I had to find a job, obviously. And I went down to Sparrows Point, and my brother was there and he said you wanted to go through as an apprenticeship, an ironworker’s apprenticeship, which is really difficult. People think if you’re an ironworker all you do is climb and look pretty but its really educational and enhanced, it’s smart. In other words if somebody said to you, you had to make a pair of steps you better measure everything correctly, angles and everything else or you’ll lose money. 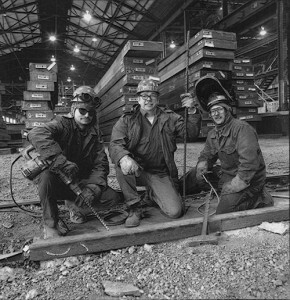 The ironworkers, I have been with them for 40 years. Most people don’t know what an ironworker is. If I told you I was a carpenter, you know I do lumber work. Pipefitter, I do pipe work. But what does an ironworker do? I feel like Sparrows Point is a Tuxedo and ironworkers where a pair of yellow shoes. An Ironworker does any maintenance on Sparrows Point. In other words you have a tin mill and they have a maintenance unit, but they just do basic work. Well if that tin mill for some reason shuts down they bring the ironworkers in to do the big jobs. We are trained in just about everything in Sparrows Point. Well 1936 we built the Golden Gate Bridge. Of course I was young then. But can you imagine we built the Golden Gate Bridge at Sparrows Point and shipped it to San Francisco. Most of the guys you worked for because it was so tough, it was the same as the military. They was always backing you. Like we’ve had jobs where we worked till midnight and work on a crane runway and then one guy comes up to me, said he just got a call. A friend of his, kid got hurt and he needs blood. Any of you guys O negative or any kind of blood and just like that four or five guys would go give blood. So you kind of like took care of each other. If you worked at Sparrows Point for four or five years you had a nickname for something you did in the past. Like well this one guy, who was from Dundalk, and he’d put his cigarettes in his lunch bag. And he’d forgot about them. So he went on the job, and then he remembered, so he went back to get his cigarettes. So he was looking through the bags and some guy saw him, cause everyone had brown bags. So you wanna know what his nickname was for 40 years, Food inspector. And then we had one guy all the time smiling, you say something he’s always smiling, nickname Howdy Duty. When they lined you up in the morning they’d tell you what your gang is. So they’d say Joe Ed you working with Bubba and Howdy Duty and you knew who it was. We’d meet at McDonalds every morning, ironworkers group, and by 10 o’clock we solved all the problems around the world. All the guys down there are my brothers. We took care of each other. 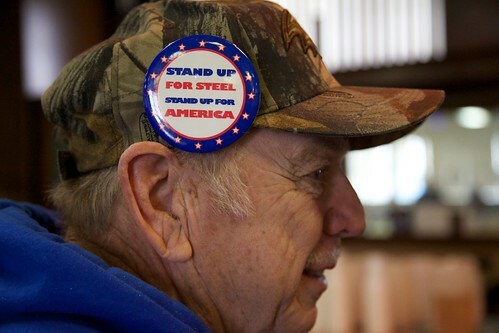 That’s the way the ironworkers’ mentality was.